The Wilson College juried high school art exhibition will be held in the Bogigian Gallery in Lortz Hall from Nov. 1 to Dec. 7, 2018, with an opening reception on November 1, 4:30-6 p.m. It is a chance for student artists to see their artwork displayed in a professional venue and possibly win cash or a scholarship. 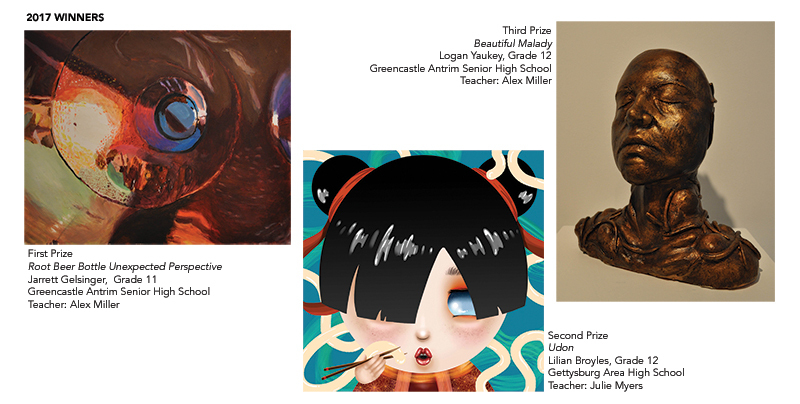 View the winners of the 7th Annual Juried High School Student Art Exhibition here. Each artist may submit up to three works of art. There is no entry fee. Artwork is to be submitted in digital (.jpg) format of up to one megabyte. Entries are to be emailed to wilsonartshow@gmail.com by the deadline of midnight on Oct. 17, 2018. Two- and three-dimensional works of art will be considered. Artists submitting film or video must be able to provide their own hardware and software should their work be accepted for exhibition. All accepted work must be exhibition ready, meaning that all 2-D works are to be wired with no exposed glass edges. The show is open to students from Franklin, Adams, Cumberland and Fulton counties in Pennsylvania and Washington County, Md. All submissions must have been completed while the student was in high school and not previously exhibited in Bogigian Gallery. Cash prizes of $200, $100 and $50 will be awarded for first, second and third places, respectively, and other works of note will receive honorable mention. In addition, the following monetary scholarships will be offered to winning students if they enroll at Wilson: $1,000 each year for up to four years for first place; $1,500 for one year for second place; $1,000 for one year for third place. The sale of work will be encouraged and no commission will be charged for sold work.